An exterior detail includes a pre-soak with a gentle or appropriate hand wash including the wheels and door jams. Drying is done with microfiber drying towels and filtered compressed air. Ferrous particles on the paint will be safely removed with an iron removal and all other contaminants, such as tar, overspray, ect. will be removed in a clay treatment. 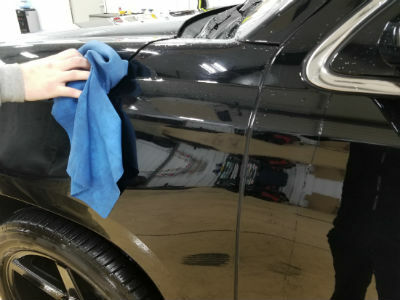 Once cleaned and decontaminated, all painted surfaces will experience a 2 or 3-step buff/polish to eliminate minor scratches. A layer of wax or paint sealant is than applied to leave the shine that everyone admires. All exterior trim is dressed including your tires to preserve them and make them look like new. Finally, all glass inside and out is cleaned for your safety and acceptance. We then look forward to your reaction to your newly detailed vehicle.